Rebel is the final and best (in my opinion) book in this series. I've been waiting to know more about Penelope and what's going on in her head since the first book and I finally got it. I finally got to see her for what she was and not just the hard and tough exterior that she portrayed in the first two novels; she's truly a force to be reckoned with...in the best way. Penelope is such a great combination of traits--she's vulnerable and stubborn and adventurous and so very strong-- and the person she eventually would wind up with would need to be able to read her well and know when to give and when to take. Enter Cruz, one of the sexiest, mature characters in the series. I absolutely loved how their relationship formed and sustained itself. 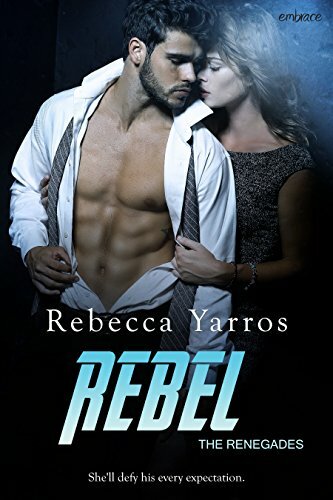 Their chemistry was sizzling and I enjoyed the way Yarros wrote their love story; it was intense and sweet and hot. I also liked the whole subplot of Cruz and his secret. This series has been a fun one from the start; it's so unique--a bunch of X-Game thrill seekers + a cruise ship + their adventures in love and life, what's not to enjoy? This final book was really a great blend of Penelope's story and a wrapping up of all of the stories that came before and it feels like a completed series. If you like adventurous thrill seekers meeting their match in love, you're going to love this series.